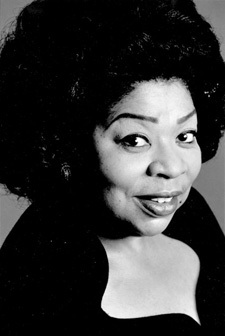 Martina Arroyo gracefully used her powerful voice to help break down barriers in the opera world during the 1960s. Now, the operatic soprano is using her influence to mentor and inspire the next generation of singers. Marking its tenth anniversary, The Martina Arroyo Foundation’s “Prelude to Performance” program proudly presented its young and talented artists in two glorious, contrasting masterpieces: Verdi’s, La Traviata and Rossini’s, Il Barbiere di Siviglia at Hunter College’s Kaye Playhouse in mid-July, 2014. Martina Arroyo’s guidance and instruction is the foundation for students who performed in traditionally staged and costumed productions with orchestra and chorus. The operas were sung in Italian with supertitles flashed above the stage. The Foundation provides an opportunity that eluded Arroyo during her childhood on the tough streets in Harlem, New York (USA). Born to a Puerto Rican father and an African-American mother in 1937, the only exposure the wide-eyed curious girl had to opera was via the radio. Her parents regularly tuned into the Metropolitan Opera’s musical programming. The sounds and rhythms mesmerized little Martina as she tried singing along. The Arroyos initially frowned upon a career in opera, pushing their daughter with her rich soprano voice to get a “stable” career, as a teacher. Adhering to her parents’ career direction, Martina obtained her teaching degree when she was 19. Her heart led to her pursuing her operatic dream. By the time she was 28, 1965, she found herself on the hallowed stage of the world renowned Metropolitan Opera in the role of Verdi’s Aida. She connected with audiences who grew to revere Martina’s artistry. Her performances took her around the globe, making her an international icon. Ever the teacher, Martina Arroyo, along with other professionals in the field, work with selected students for six weeks, supporting them as they continue striving to reach their operatic potential. Best of all, the students do not pay a dime to be in the program. Martina’s alma mater, Hunter College receives hundreds of applications for the program from which Arroyo personally selects 35 lucky students to participate. Although she took her final bow in 1991, Arroyo, now 76, pours her heart and soul into the young artists, who demonstrate their appreciation by exceeding her high expectations for each of them. Martina called the greatest honor of her life was when she was bestowed The Kennedy Center Honor, December 2013. She was hailed by President Obama and a host of dignitaries as one of the finest opera singers of her generation. But don’t look for a diva because you won’t find it in this Harlem girl. Martina Arroyo rolls up her sleeves and gets “down and dirty” with her students, teaching them the behaviors and activities of the trade, encouraging them to hit the high note. The students’ challenging work culminates with Hunter College Kaye Playhouse’s extravaganza, considered by many operatic professionals to be an almost Met-worthy performance. Many of Arroyo’s students have graduated to opera stages across the United States, including The Met as well as international opera houses. They readily admit they could not have reached their prominence without Martina Arroyo and her Foundation’s guiding program… proving that Martina Arroyo is a legendary singer with the beautiful voice – and a beautiful heart to match.